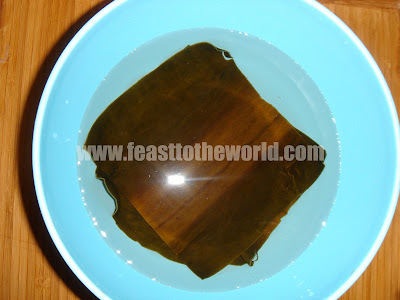 I think it is rather essential for me to write about the dashi, given my recent fixation on blogging a lot about food from Japan. For those who doesn't know, this is a delicately, mild flavoured stock that has a strong presence in Japanese cuisine. Along with the the soy sauce, mirin and sake, it contributes to the umami flavours of any Japanese dish. Unlike a lot of stock that are laborious and time consuming, this is incredibly simple and easy to prepare, it takes literally minutes. The ingredients lists too is wonderfully short. 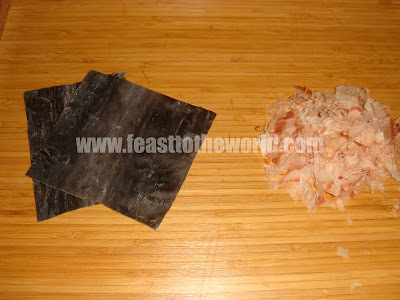 All you need is kombu, katsuobushi and water. That's all there is to it. Easy! Both kombu and katsuobushi are easily available in all good Japanese supermarket, and if you don't live anywhere near one, you can order them online through Japan Centre, along with any other Japanese ingredients. Kombu, dried sea kelp are first soften in cold water and then heated up along with the water. 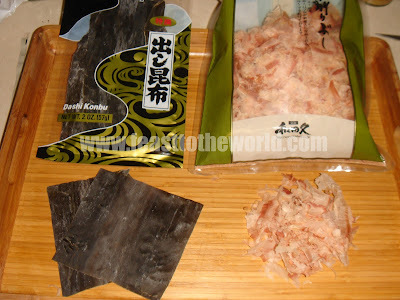 Katsuobushi, bonito flakes are then added before straining to get a clear, clean stock. The water should never be allowed to come to a boil as this will produce a bitter dashi, not really what we are trying to achieve here. Of course there is always the easy option of buying a packet of dashi granules which are now commonly available. Most households in Japan tend to use this as it is quick and convenient and there is absolutely nothing wrong with that. 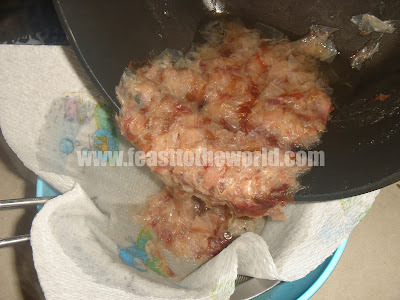 However, like most things, a homemade version has the kind of fresh and delicate taste that you will not get and also, doesn't contain any of the dreaded MSG. I like to make a big batch of the stock and then freeze them in individual ice cubes tray so that there is always a good supply of it at hand when I'm too busy to make it from scratch. 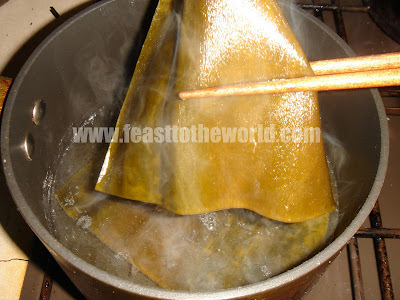 Firstly, clean the kombu by wiping it with a kitchen paper. In a bowl, add the kombu, along with 800ml of water and let it sit for 15-20 minutes until soften. Transfer the kombu and the water into a pan and heat up gently over a low heat. 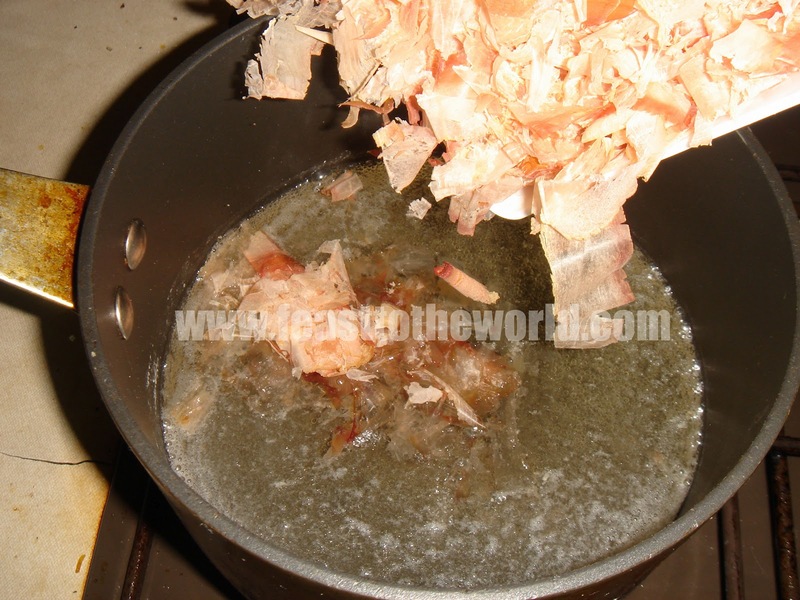 When tiny bubbles start forming at the base of the pan, remove the kombu immediately. Do not allow the water to come to a boil. Add the katsuobushi/bonito flakes into the pan and remove the pan from the heat. 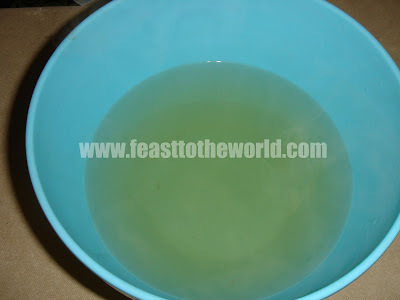 Let the mixture sit for 5 minutes, before straining the liquid with a fine sieve or a sheet of kitchen paper. What you should have here is a clear stock that is now ready to be used in an arrays of delicious Japanese dishes.